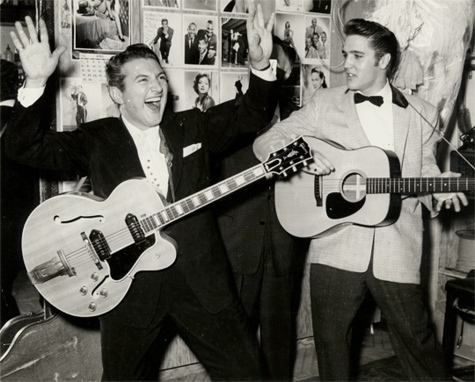 On the surface, it seems unlikely that Elvis and Liberace would have had anything in common. They were born a generation apart. The latter catered to a conservative adult audience in the mid-fifties, while Elvis appealed to a youthful generation trying to escape the conformist world of their parents. Yet, through mutual respect, the two men, who were each savaged by the press for different reasons, were able to bridge the generational and cultural gaps between them. Wladziu Valentino Liberace was born on May 19, 1919, in Wisconsin. 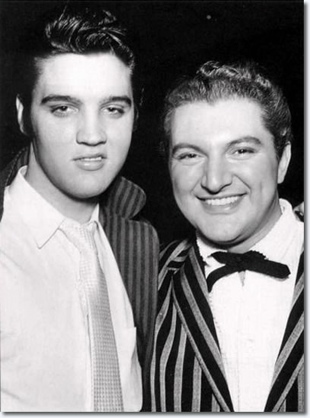 Unlike Elvis, who was closest to his mother, Liberace’s father had the greater influence on him. “My dad’s love and a respect for music created in him a deep determination to give his legacy to the world,” the son recalled. His mother, on the other hand, considered her children’s music lessons a wasteful use of the family’s meager resources. In the 1940s, Liberace created and refined his musical act. Using the candelabrum as his signature stage prop, he billed himself as “the most amazing piano virtuoso of the present day.” Finding Las Vegas the perfect venue for his extravagant and flashy act, Liberace accumulated wealth and a rapidly expanding fan base. By 1955 he was making an unprecedented $55,000 a week at the Hotel Riviera and had over a quarter million fans in better than 200 fan clubs across the nation. Before Elvis Presley burst on the entertainment scene to displace him, Liberace was the biggest pop culture superstar in the country, and the highest paid one. 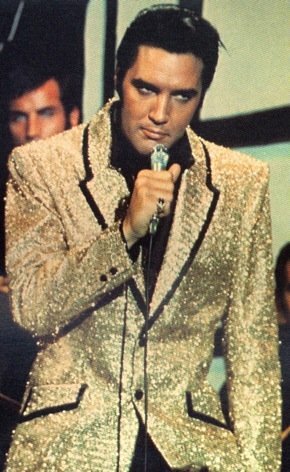 Colonel Parker must have liked the look of Liberace’s gold jacket on Elvis that evening. 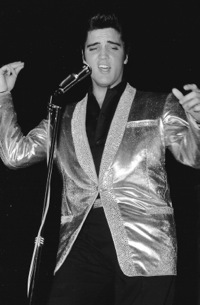 He soon had Nudie Cohen of Hollywood fashioning a full gold lamé suit for Presley to wear on his spring tour, which opened in Chicago just four months after the November dressing room jam with Liberace in Las Vegas. Like Elvis, Liberace spent lavishly to incorporate materialism into his personal life. Unlike Elvis, though, he had a more traditional sense of “opulence.” In 1953 his first celebrity house was designed and built with a piano theme throughout, including a piano top shaped swimming pool. Lavish furnishings, an ornate bathroom, and antiques throughout were included in his dream home. 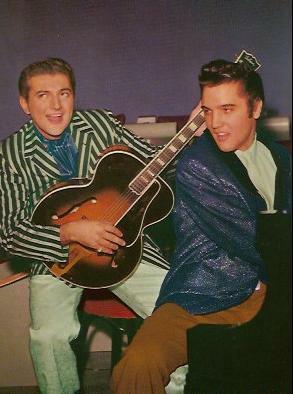 While Elvis made Hollywood movies in the sixties, Liberace’s act continued to be a major box office attraction in Las Vegas. Even though Presley displaced him as the top draw on the strip in the seventies, Liberace continued to attract respectable crowds at the Las Vegas Hilton, where both entertainers performed. "Through mutual respect, the two men, who were each savaged by the press for different reasons, were able to bridge the generational and cultural gaps between them."